In every town, you see these now. Once a thriving epicenter for commerce and labor to co-exist and thrive. America the manufacturing powerhouse that took the ingenuity of the Industrial Revolution and turned it into an economic bonanza. From the 1930s to the 1970s, the sweat, blood and muscle of the American worker represented the kind of society other countries dreamed of. Balanced with high taxes on the rich and corporations paying their fair share, society was a place of relatively low unemployment. It was a place with a middle class that could more than keep up with the cost of living and inflation. It was where the much ballyhooed 'American Dream' was born. Born of the ability to find a job, go to work, get a good education for your children, own a home and a car. Sure there were incredibly inequities towards racial minorities and women but in general terms, the way the middle class was build and sustained itself, off of in house labor, laws to protect the Unions and workers and taxes that made the top tier pay their fair share, society worked pretty darn well. Since that point though, something happened. A loud cry from the nation's wealthiest of them all came about as their new poster boy, Actor Ronald Reagan, was ushered into office. Using his tremendous acting skills he tricked many of the same baby boomers that had been out protesting Vietnam and speaking of peace and love while smoking weed at Woodstock, to put down their signs and joints and start caring about themselves. Their strategy was to divide America into different groups. The haves, who knew better than you and owned the companies you needed in order to be employed at all... and the have-nots, those poor people who went on welfare and stole your hard earned tax money with no actual will to go to work for themselves. They attacked Unions as threats to companies' ability to hire. Made them villains for demanding such incredible things as health care benefits or higher pay. Used the potential for strikes as a way to prove that they didn't care whether you had a job or not. Used Union dues as a way to pretend you were being taxed for their political agenda. When Reagan went after the Air Traffic Controllers he did so to make a point. Unions had no place in this new Right Wing America. Corporate donors didn't want it and their political appointees would work on their behalf. From that point forward the American experience has worsened dramatically. The American Dream became more a dream than a reality, so distant a dream in fact that it was like the one where you're sleeping with a supermodel who in real life doesn't know your name and would likely send security guards to rough you up if you got too close. The Wal-Marts and powerhouse corporations took advantage. Wal-Mart stopped buying USA only products and started to push their suppliers to have costs for their products so low that in order to be featured in the store it was a pre-requisite to move manufacturing overseas. Pennies for the worker makes for cheaper product. They continued to lower corporate tax rates, taking them all the way down from the one time 90% rate to a much lower 34% under George W. Bush. It was pretty amazing that when Democrats discussed returning the rates to the 39% they were prior to Bush that the Republican party, bought wholesale by their corporate masters and the media which was owned almost entirely by corporate entities whined like this was the beginning of socialism. Of course there were a lot of Americans with zero grasp of History to know what the hell socialism was or the prosperity we as a nation have had with strong unions and with higher corporate tax rates. All of this made no sense anyway since Republicans (and many corporate Democrats who might have been Republicans in the past but thanks to Reagan shifting the entire political spectrum, real moderates no longer existed) used their powers to give tax break and loopholes galore to companies. To the point where GE and many other corporations don't even have to pay a dime to the IRS on their billions of dollars in earnings. The tax burden has been consistently shifted in a way where the poor and middle class are expected to shoulder a heavier burden than the top 1% than own practically everything in the country. It's been said far and wide with complete merit this year that 400 people own more wealth than the bottom 150,000,000 combined. That's a staggering statistic. You'd think, hey they convinced Americans and even Democrats like Clinton and Obama to fall for the trickle down economic nonsense, they used work training tapes and propaganda in the media to make union membership practically non-existent. They stalled forever on raising minimum wages while inflation priced people out of society and were gleefully overjoyed when those people, out of money no matter how hard they worked had to turn to credit debt to make ends meet. But that was never enough. Nothing is never enough. Greed is a disease. It needs to be cut out like cancer. Forcibly and physically. It exists to devour all in its path and continues to grow no matter what may temporarily hinder it. Even with all of that they wanted more. They pushed for free trade agreements and then got Government officials to approve of and give tax breaks for outsourcing, sending your jobs overseas to pay workers pennies... not just for Wal-Mart but for every industry. Now you were expendable. The Manufacturing industry is on very weak if not last legs in this country. The places where you would normally see textile plants, automotive plants, paper mills, etc... they're filled with unemployed workers and abandoned empty building space that the cities can't fill with new owners or new hope. Free Trade Agreements were just the start. They spent the 1990s lobbying to get media consolidation so they could snap up every TV and Radio Station as well as every newspaper in every town. They now controlled the message. They owned what you heard and what perspectives you were going to be informed from. Everything you would learn from here on out was told with spin. Your kids also would fall prey to this as they bought up the textbook manufacturers and pushed their corporate backed candidates in races for school boards where textbooks were approved. They now could rewrite American History in classes. Whitewash any negativity associated with our past. A deluded American public is defiant and much more apt to defend the dysfunctional societal setup here than ever demand change. So The Revolutionary War was a war based on high taxes from the Government (corporations pet cause) and not because people were mighty upset about the tax breaks being given to the East India Tea Company nor actual representation in Congress. The Civil War was about States Rights, not slavery. Hell slavery wasn't so bad, cheap labor never is, according to our new history professors. They got Congress to enact laws protecting loan schemes and hedgefund managers who made money off of you losing yours and set you up to fail. Then when they drove everyone into an abyss where the lack of jobs added to the impossible payment conditions of the loans meant everyone had to lose their homes to foreclosure, they went to the Government and put their hands out to take your taxpayer dollars again with little to no oversight on how to spend it... took those billions and turned them into hefty corporate bonuses. A reward for ripping you off. They even made sure they were well compensated in other situations as well. Want to start some wars? Great! Our corporations will be there to provide minimal services with zero accountability, just use money laundering, er, war appropriation bills to transfer those trillions of dollars into our bank accounts. Oil spills? Sure we'll clean it up but expect us to bill you for our mess. Oh and we want further tax cuts and more drilling permits, since you know, we've shown such massive responsibility with the ones we're operating currently. Health Care Crisis? Sure we drove rates on insurance premiums through the roof so badly that you needed a massive "reform" but give us 40 million mandated new customers and no controls on future premium prices. Sounds like a win to us.. oh but we're still going to demand its repeal because we still aren't cool with paying out any actual claims let alone for those sick pre-existing people. It would be laughable if it wasn't so horrific. Americans are unemployed at incredibly high rates. If you look up any job site you'll notice most the jobs pay very low wages and have little to no benefits. The corporate elite have already won, haven't they? What's possibly left for them to pillage? If this were a war, our city would be destroyed from firebombing raids, the last remaining structures still ablaze, a few survivors covered in soot roam the area listlessly unaware of what to do next. There is a class war in America but it's been waged by the ultra rich and it represents the conflict in Israel. The Israelis have missiles and planes and nukes and the Palestinians have rocks, sticks and the occasional suicide bomber. Not a fair fight and we've been annihilated in similar fashion. What else could they want? They have everything already. My ex-boss once said this about one of my accounts: "I never want you to be happy. If you make $1 million tomorrow in sales on that account, work for $1.5 million the next day and $2 million the day after that. Being happy means you're complacent and have given up trying in my opinion." Now he said this when at that point the account had never broke $55k in a single day. It let me know how vast his greed was and greed is an animal that never stops eating because it's never not hungry. To me when is enough, enough? If I own at a company that isn't #1 in the world but is in the top ten, makes really good money to support me and my family and my workers. It shows some growth but doesn't always light the world on fire. Isn't it good enough to be comfortable? Do I have to keep that company growing bigger and bigger, taking on debt and risk to my own personal finances as well as the job security of my workforce? For whom am I doing this for? I imagine if you get into the stock market game you've already declared: "I am never going to be happy! I want to own it all and be a billionaire!" Giving away that sort of autonomy with your company means you don't mind having the influx of cash nor the masters whom you now must answer to. Myself, I see things differently. You have to understand where these people are coming from. Their intense need for power and control allows them to take risks and have their companies obtain cash for the purpose of expansion and growth. They're cool with having to meet huge goals for their financial benefactors because they too want that growth. It increases their own pocketbook size. Step by step they use this as their ladder to power. They become more and more rich and they use that financial status to gain access to the politicians whom might have never given them a listen before. You realize really quickly that these people aren't there for their constituents, they're there for you. You can offer them a nice above the board $5k donation for their primary and general campaigns and another $25k, $50k, hell even $100k for some outside group that will advertise on their behalf. And that my friends, is endgame. They want it all. The only way to get it all is to decimate the American workforce and their rights to the point of making us like China. They need no environmental regulations, no safety regulations, elimination of paying social security taxes or paying into Medical Benefits... and then they need to gut minimum wage.. to say, "stay competitive in the marketplace with other major industrialized countries"... since China and India are definitely industrialized at this point. They go after Public Service Unions partially to break the last bastion of Democratic Party Support after their bought and paid for US Supreme Court gave them the Citizen United Ruling and allowed them to advertise with unlimited dollars to buy any election they wanted, this just whittles down their opposition quite a bit. Also though they did it because with those unions out of the way their Republican friends can bring in corporate low paid workers from private firms to do these jobs. The CEOs will negotiate a hefty fee for this out of your tax dollar but don't expect that to be reflected in these workers' pay or benefits. Also by taking out teachers, they can work to force kids into corporately funded private schools which will double as a propaganda factory, telling children only what they want them to know and making them feel it's okay to be trained to work at their slave labor camp like jobs. Going after schools and teachers is the last real hurdle to the total revising of the American Education System in a way that will lead kids to accept and understand the importance of corporate overlords and why critical thinking is dangerous. They want it all and they have a few well outlined goals to take it. Once they achieve endgame, that is the systematic destruction of the middle class and the regulations which protect them in the workforce, they can begin to institute their dream scenario. Jobs might return to America but it won't resemble previous American Industrialism. For some companies overseas, they already see America the way we see China and India. Honda and Toyota and many of the German Auto Manufacturers have invested huge in building auto plants in Mississippi and Tennessee and Ohio. Why here? Non-union states run by Republicans that gave them sweetheart tax breaks. They can pay their workers rather low wages compared to the going rate of their profession and not have to deal with any of the usual "headaches" that having a strong financially balanced society might have. Being a good corporate citizen with a conscience costs money after all. Look at what IKEA has done. In Sweden their workers would make $19 an hour and get 5 weeks paid vacation. Sweden's economy thrives, unemployment levels are reasonable and they have a government run health care system. Things are good for the Swedes. You'd think IKEA would say, "we've done very well here, let's continue to have great jobs in these conditions". But greed doesn't allow them to think that way. They want to make more money than they know what to do with. So they come to a downtrodden town like Danville, VA. This town has been run ragged by other manufacturers bolting from their city for similar outsourcing reasoning. Greed killed them. Yet it seems by some sheer magic, they would be spared from the same fate as many dead towns now face, when IKEA came to open a plant. And then they did. Low wages near the minimum wage, only 12 days of vacation, most of which were dates picked by the company not by you, a horrible morale and just not a good environment. They are but another symptom of what America is becoming. The endgame is near. Corporate lackeys like Scott Walker and the like, they are willing to fight this war (even stealing elections to make sure of it) this time whereas their predecessors may have balked in the face of overwhelming anger. The John Kasich's, Rick Scott's, Rick Snyder's, Mitch Daniels... they all feel emboldened to finally drive the final nails in the coffin of union existence on state levels. The Paul Ryans and Eric Cantors feel emboldened to make the attempts to go after Social Security and Medicare/Medicaid in Washington. This is it, they've wanted it all for years and now they're finally going after it. We wander down a completely uncharted path. They've never been this close before. 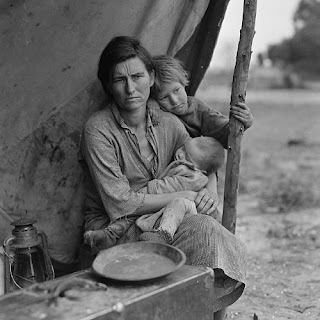 Not even in 1927 or during the Great Depression. It's up to us to fight them off. Court battles, mass protests, civil disobedience, general strikes, the greatest get out the vote effort ever... The term "keep your powder dry" has never been so appropriate. Are you ready to fight for the soul of America?